KANSAS CITY, Missouri -- Talk about a super-mom! Nayzia Thomas, a college student at Johnson County Community College in Overland Park, Kansas, didn't let a little thing like labor get in the way of finishing up her semester. Thomas' mother snapped the shot of the soon-to-be mom. She said the photo "encompassed who her daughter is," and Thomas agreed. Once it was time to put the work down, she delivered a healthy baby boy, but not without complications. "On 12/12/17 we had a healthy baby boy. However, I experienced major blood loss & my body went into shock post-delivery. It was very scary, but his father was right there to take over when I went unconscious," Thomas tweeted. Thomas lost a lot of blood and had to get a blood transfusion. After it was all said and done, Thomas has a beautiful baby boy AND finished the semester with a 3.5 GPA. Thomas says she got an 85 percent on her final and an A on the paper she was working on. 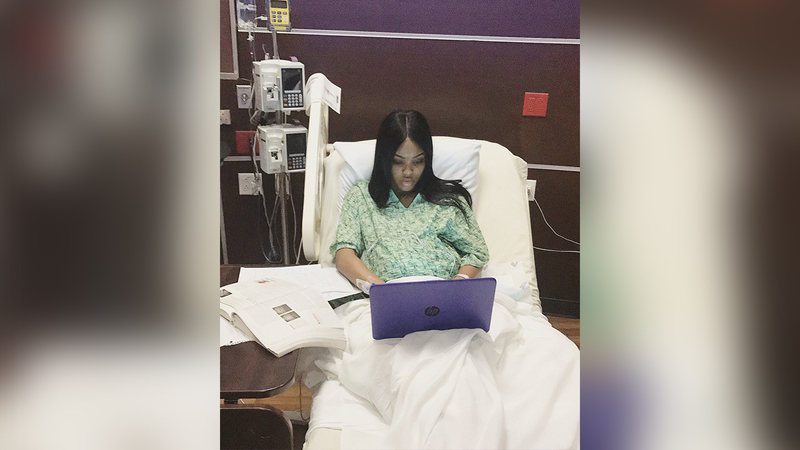 Thomas's school work didn't stop there: She had more to do after she gave birth, but she says she completed all of her finals before she was discharged from the hospital.